Includes those reported taking part in this activity ‘more than once a day’, ‘once a day’, ‘more than once a week’, ‘at least once per month’, ‘at least once per year’, and ‘less than once per year’. Cultural activities: participated in or attend traditional First Nations, Métis or Inuit activities such as singing, drum dancing, fiddling, gatherings or ceremonies. Hunting, fishing, camping: taken part in hunting, fishing, trapping or camping. Seasonal activities: activities such as gathering goose eggs or wild plants for example, berries, sweet grass, roots or wild rice. Source: CICH graphic created using data adapted from Statistics Canada, Aboriginal Children’s Survey, 2006. http://www.statcan.gc.ca/pub/89-634-x/89-634-x2008001-eng.pdf -accessed August 22, 2017. 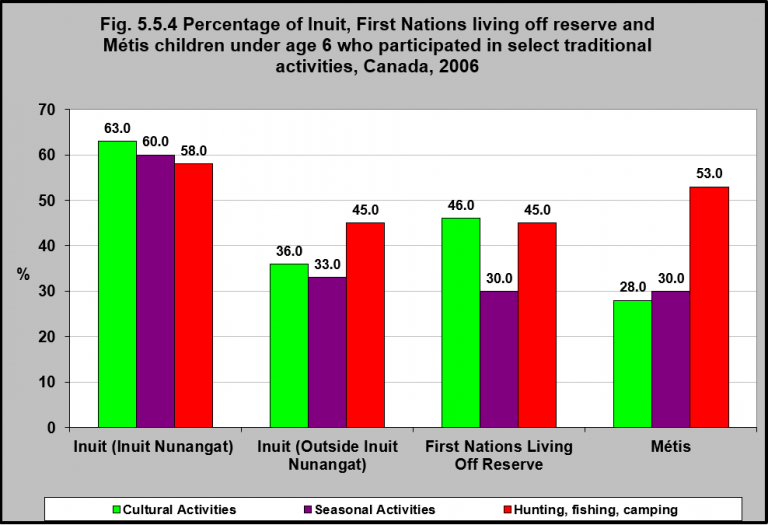 In 2006, Inuit children under the age of 6 living in Inuit Nunangat participated in traditional activities more than First Nations living off reserve and Métis children of the same age. Inuit children under 6 living outside Nunangat, participated in cultural and seasonal activities about half as much as Inuit living in Nunangat. Métis children under age six were more likely to hunt, fish, tramp or camp compared to First Nations children living off reserve. First Nations children under 6 living off reserve were almost twice as likely to participate in cultural activities than Métis children of the same age group. Research has indicated that strong cultural identity contributes to resilience and is a protective factor for at-risk Indigenous communities.1 Building a positive cultural identity should begin early in order for children to grow to become healthy and leaders in their community, and to ensure the survival of their culture.2 Participation in traditional activities is a cornerstone of building a positive cultural identity. 2Government of Canada. (2013). Aboriginal children: The healing power of identity. Ottawa, ON: Author. https://www.canada.ca/en/public-health/services/health-promotion/childhood-adolescence/programs-initiatives/aboriginal-head-start-urban-northern-communities-ahsunc/aboriginal-children-healing-power-cultural-identity.html -accessed September 23, 2017.